Let’s talk about hand held turning tools. There are hundreds of types and brands of woodturning tools. The first thing to consider is what kind of woodturning you will be doing; spindle turning or bowl turning or both? If you’re not sure, maybe purchasing a set of hand held turning tools would be right for you. In the beginning, buying a pre-bundled set is usually less expensive, but be careful that you don’t get several tools that you will rarely use. Generally these sets are not top of the line quality. I suggest that you choose your hand held turning tools separately and make up your own set. A basic beginner set would include: a bowl gouge, spindle gouge, round point scraper, parting tool and a skew. The ½” bowl gouge has a deep flute. The flute is the groove down the center of the tool. The wood chips travel away from your work down this grove as you do your turning. This deep fluted gouge is mainly used in bowl turning and will remove material fast and is easy to control with a little practice. This is the tool used when beginning your piece or roughing out your item. The ½” spindle tool has a shallow flute and is used for turning spindles, pens etc., but can also be used for turning boxes and shallow bowls. It is a good tool for doing detail work. A ¾” round point scraper can be used to remove any tool marks left from using the gouge and to make a nice smooth radius where the bottom and sides of the bowl meet. Because this tool sits flat on the tool rest it is easy to control and some people use this as their main turning tool, but this should be used as a finishing tool, don’t’ get into this bad habit. A 3/16” parting tool can be used to part off or remove your turned item from the tendon being held by your chuck, part off box lids, pepper mill knobs or as depth indicator grooves and so on. 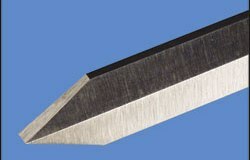 I recommend a diamond shaped parting tool, as pictured below, as it’s less binding than the flat sided tool. A ¾” skew is a very useful tool. I recommend this with some hesitation to a beginning turner. This tool is mainly used with its narrow edge on the tool rest; it requires a lot of tool control which comes with a lot of practice. You can damage your work piece in a split second if not being very careful using this tool. For all its difficult characteristics, it does very good work making beads, knobs etc. and when used on its side it will produce smooth surfaces on goblets, boxes and other woodturnings. These five hand held turning tools will get you started without spending a lot of money. Once you’ve gained experience, you may decide to buy these wood turning tools in a variety of sizes. There are a few things to watch for when purchasing woodturning tools. One is how the tool is measured. A spindle gouge is measured by the diameter of the shaft itself; a bowl gouge by the flute width. When you add 1/8” to the flute width you get the shaft size. The Oneway Company differs in their method of measurement. Their Mastercut tools are measured by shaft diameter not flute width. Parting tools are measured by the width of their cut, 1/8”, 3/16” etc. Scrapers are measured by the width of the tool itself. Their thickness usually increases as the width increases. Another decision you must make is the hardness of your hand held turning tool. The harder the tool the less sharpening is required. Even inexpensive tools are usually made with HSS (high speed steel). Catalogs will list a hardness number; the higher the number, the harder the steel, the higher the price. Consider how much you will be using the tool. If the tool will be used a lot, like your gouge, I suggest the best that you can afford. A skew is not used as often; you may want to consider a less expensive one. You can’t go wrong with Robert Sorby tools. They offer a wide selection and are of great quality. I only switched to “Oneway” Mastercut gouges because the tools are double ended as seen in this picture this allows me to have a different type grind on each end. I like their separate handles. Each handle has a ½”diameter hole in one end and a 5/8”diameter on the other end to accept different diameter blades. I can leave a little of the tool exposed for close work or a lot exposed when some leverage is needed. If more leverage is needed for big projects, I put two handles together. Whichever tools you choose, remember that none of them will do their job unless kept sharp. Don’t be afraid to sharpen them often. It will take years to wear out a turning tool and they are safer and easier to use when sharp. 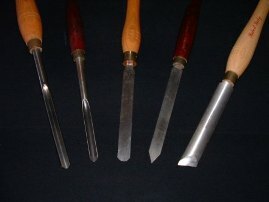 I hope these recommendations will help you in choosing your woodturning tools.